America loves to grill. Steaks. Dogs. Burgers. But we're tired of your lazy barbecues, and you know who you are. Stop attempting to throw a barbecue without having a single condiment. Stop calling your get together a potluck to completely rely on other people's food. Instead, please marinate something. Buy the GOOD hot dogs, not the dollar store mystery meat. 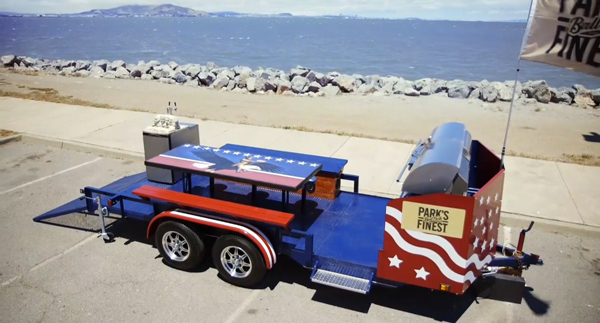 Ball Park understands this need to elevate barbecue mediocrity and hence partnered with Destination America and Discovery Digital Networks' Patrick Norton to create a grill to match the awesome that is America. 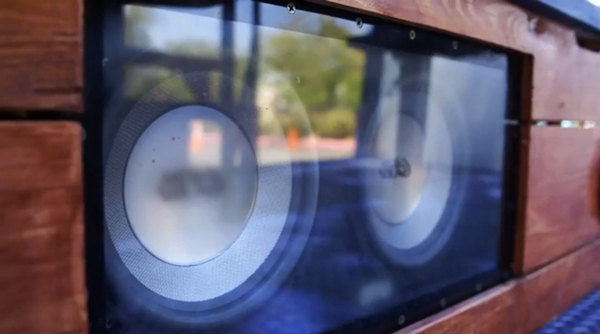 The grill comes tricked out with pretty much everything that bleeds USA. 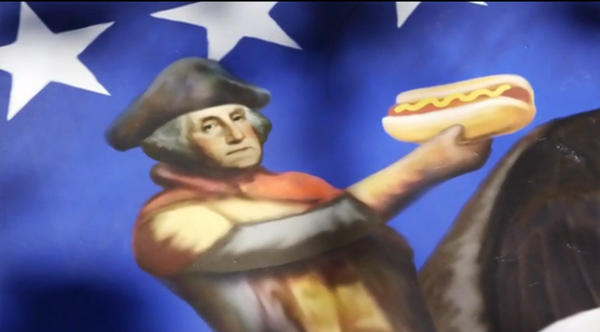 Wait, does it have a mural of George Washington saddled atop a Bald Eagle while holding a hot dog in his hand? Check. 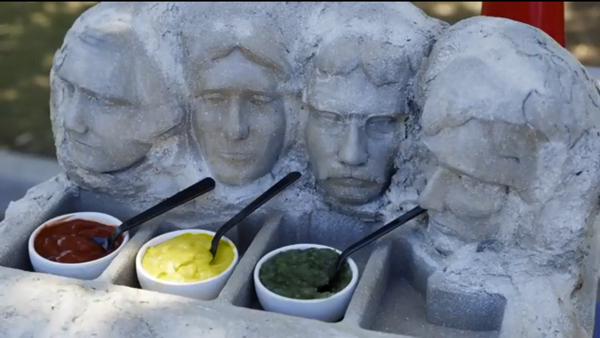 Wait, is there a condiment station that features an American National Monument? Double Check. And yes, of course it's Mount Rushmore. Wait, but what can I do with my American Flag? You raise the flag proudly on the first grill that features its own flagpole. You can even fly it 24/7 like the White House. Just remember flag etiquette. At its core, the grill features a dual double-wide grill with 7 burners packing 114,000 BTUs for customizable grilling. Tetris aficionados will be pleased to know that the burners can fit close to 100 hot dogs over 1600 square inches of cooking surface. 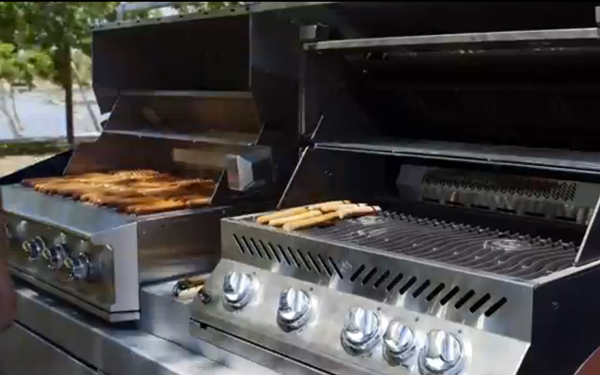 The grill also features kabob and rib inserts, veggie grate, stainless steel cooking rods for searing, heavy duty 12-gauge flame stabilizing grids and a motorized rotisserie. COME. GET. SOME. 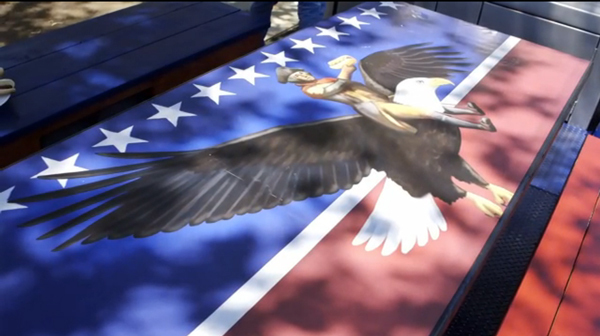 The barbecue trailer also comes complete with a table fit for eight people with the aforementioned George Washington Americana-style portrait. A Bluetooth wireless sound system allows any guest to connect their phone and play tunes through its (4) speaker, (2) 12" sub woofer, 1600 Watt Amp sound system. We personally recommend the Star Spangled Banner, God Bless America, America The Beautiful, or if you have to please your tween audience, Miley's 'Party in the U.S.A.' This grill practically invites you to dance atop the picnic table - just make sure to avoid desecrating our first president's face. 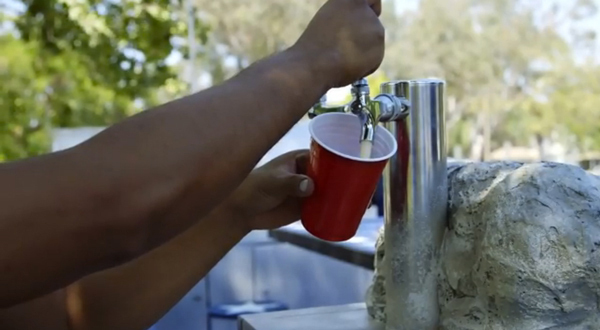 Most importantly to our readers, the trailer features a beer tap equipped with multiple kegs of beer. Finally, we can pour a perfectly carbonated American Beer while staring at a replica Mount Rushmore while listening to Miley while eating a Cracked Dijon Mustard beef frankfurter. Thank heaven. 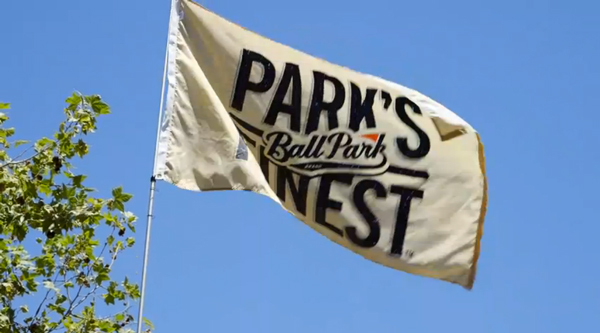 The collaboration between Ball Park, Patrick Norton and Discovery Communications comes amidst a campaign to promote Ball Park's newest premium frankfurter offering: Park's Finest. You can find the new dogs in four different varieties including Signature Seasoned, Cracked Dijon Mustard, Slow Smoked Hickory and Smokehouse Barbecue. Officially, Park's Finest launched earlier this year and can be found in the refrigerated section of grocery stores nationwide. The 14 oz package features seven dogs and the MSRP comes in at $4.79. The full, three-episode-web series documenting the grill's construction is available here and showcases the work that TechShop put into this behemoth. Consumers can also enter for the chance to win America's Finest Grill by submitting a photo via Instagram and explaining why you're worthy of being named America's Finest Grill Master. Just make sure to use the hashtag #FinestGrillMaster. 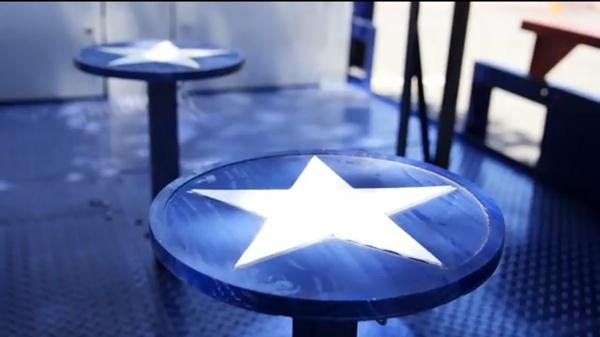 There may be thousands who think they deserve this grill, but only one can sit atop the all-beef throne. Because when you play the game of franks, you win or you do the dishes.